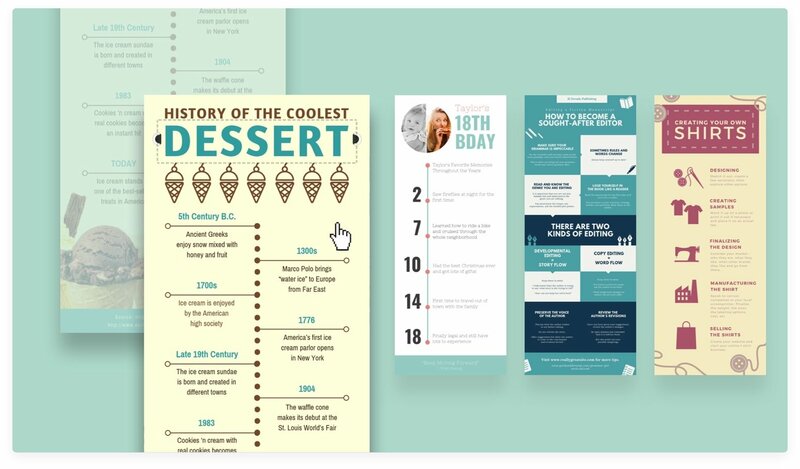 Make an infographic in minutes, not months, with Canva’s easy-to-use infographic creator. Make data beautiful—and easy to digest. With Canva’s free infographic maker, there’s no need to struggle with complicated design software. Simply choose an infographic template, add your information and there you have it: A stunning custom infographic. Canva has an extensive range of templates and thousands of illustrations—meaning whatever your subject matter, you can bring it to life with our free and easy infographic creator. Select an infographic template, or design from scratch. Canva has a huge range of professionally designed infographic templates for you to choose from. Add graphic elements from our extensive library. We’ve got over 2 million icons, illustrations and stock photos to choose from. Or you can upload your own! Change the colors, fonts, backgrounds and more. It’s easy to customize your infographic in Canva. Add your information to the infographic. Click on the text placeholder and add your own message. Download, share or print your finished infographic! Facts and figures don’t need to be dull. With Canva’s Charts tool, you can add all the hard data you like, and keep the eye-catching look of your infographic. With customizable colors and various styles including bar charts, line graphs and stylish pie charts, you can forget about old-school graphs—these charts are a work of art. Canva is jam-packed with all of the images you need to turn dry facts into stunning graphics. Our library has over 2 million photos, icons and illustrations, with thousands of free images and premium images at an affordable $1. Got some spectacular graphics of your own? Upload them in seconds and add them to your infographic. Whether you’re creating your infographic for a presentation, marketing materials, or a school assignment, Canva’s infographic creator has you covered. Our templates are a versatile way to get the look you want, fast—or you can design from scratch with our easy drag-and-drop tools. And you can bring the whole team on board! Our infographic maker is designed for collaboration. How much does it cost to create an infographic in Canva? Nada! Zip! Zilch! Canva is 100% free to use. You would only need to sign up for a free account to start utilizing our templates, design tools, and design elements. There are also premium elements available, but they only cost $1 per one-time use, which is cheaper than your morning cup of coffee. Can I embed my infographic on my website? Absolutely! In addition to sharing your infographic design on social media, you may also embed it on your website or blog. All you have to do is click “Share,” choose “Embed,” copy the code displayed, and plug it into your blog or website’s HTML viewer. No website? No problem! Canva made it possible for you to serve your audience a fresh dose of interactivity. Once you’ve finished designing your infographic, click on “Share,” select “Link,” copy the URL, paste it on your address bar, and watch your infographic magically transform into a shareable interactive website. Any edits you make to the design afterwards will be reflected automatically online. Who says you need to be a coder to make your own website? How can I add personal touches to my infographic? You can easily apply your own branding to the infographic by uploading your logo, implementing your color palette, and using consistent fonts. To upload your logo, click on the Uploads tab in the left-most panel, choose the “Upload your own images button,” and select any PNG, JPEG or SVG file you wish to insert on the design from your computer. Canva is an amazing online design and editing software. The best thing about this software is that it is completely free and allows you to create images, infographics, curriculums and many other things. It has a very intuitive and easy to use interface. I LOVE Canva! I use it every day at work. My company does not have a graphic designer to make infographics or certain pictures for our clients, and I can do a lot of that stuff. It is very easy to use, and provides you with TONS of templates to follow. With Canva you can create posters, infographics, documents, graphics, etc. in a very simple way. What I like the most about this graphic design program is its ease, its usefulness and its professionalism. Best of all, it's free, plus it has hundreds of preloaded images and templates.